The criminal court has postponed the sentencing of 15 opposition supporters accused of protesting at the main international airport to August 6. A sentence was expected on June 14, but the court delayed the hearing after presiding judge Sujau Usman was promoted to the High Court last week. If the sitting judge in a case leaves the court, the case is immediately referred to the Chief Judge, who then has to allocate another judge to oversee the case. “We still don’t know if a new judge has been allocated to the case. Even then, the new judge cannot immediately issue the sentence. He has to hear the case again,” said lawyer Nazim Sattar. 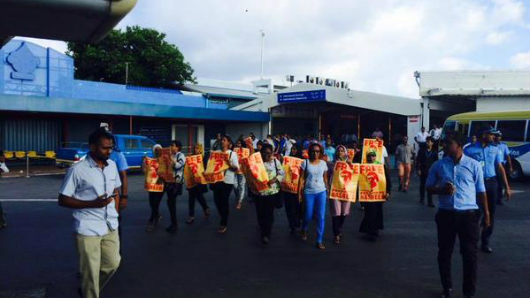 Some 14 women and one man are being charged with disobedience to order, after they were arrested carrying posters of imprisoned ex-president Mohamed Nasheed at the Ibrahim Nasir International Airport in March. The 15 belong to the main opposition Maldivian Democratic Party (MDP). The Freedom of Assembly Act prohibits protests at airports and carries a MVR150 (US$10) fine, or six months in jail, house arrest or banishment. 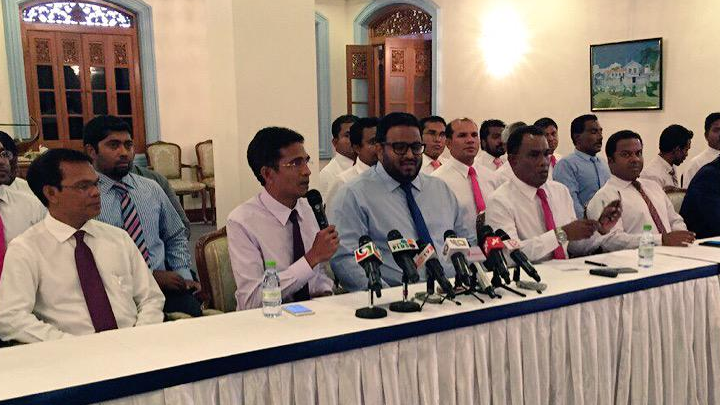 Nazim contends the group’s actions do not constitute a protest. “State witnesses include testimonies from the police officers who arrested the individuals. How can that be used to prove they were protesting?” Nazim questioned. Malé City deputy mayor Shifa Mohamed and MDP women’s wing vice president Shaneez “Thanie” Saeed are among the defendants. The criminal court had previously conditioned the group’s release from remand detention on avoiding protests. The High Court later said the court’s conditions are unconstitutional. Shifa has previously accused the criminal court of misconduct and bias in the treatment of those arrested at protests, and said that the individuals are being punished for the same crime twice with the 60 day protest ban. Judge Usman sat on the three-judge panel that sentenced ex-president Nasheed to 13 years in jail on terrorism charges. The trial was widely criticised for apparent lack of due process. Concern is growing over the health of opposition leaders in custody. The Adhaalath Party president Sheikh Imran Abdulla’s family have said the government is attempting to weaken him physically and psychologically, while under police custody. Meanwhile, ex-president Mohamed Nasheed’s lawyers say he is being denied access to specialist medical attention despite recommendations from doctors. He is serving a 13-year jail sentence on a terrorism conviction, relating to the detention of a judge during his tenure. 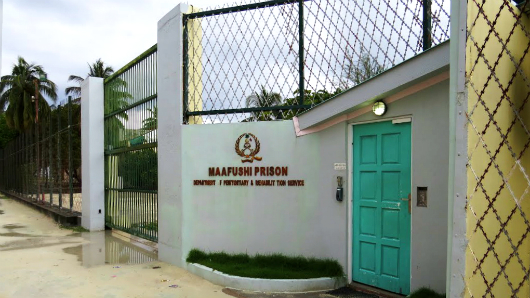 The opposition leader’s lawyers said doctors at the Maafushi Jail health center and at a Malé military clinic in May recommended that he get a MRI scan. But the government has not authorized the scan, lawyers said in a statement today. Nasheed’s lawyers also said they were denied their weekly visit with Nasheed today. “The government suddenly cancelled this visit today without any rationale, via a phone call to the lawyers. Since President Nasheed’s transfer to Maafushi, his access to lawyers have been restricted by the government,” the statement said. Sheikh Imran is also charged under the 1990 Anti-Terrorism Act, but with threatening to harm police officers and inciting violence at a historic anti-government protest on May 1. He has pleaded not guilty to the charges. The criminal court last week ordered police to hold Imran in pre-trial detention until the conclusion of his terrorism trial. Imran was brought to the AMDC clinic in Malé today. He was also taken to see a doctor the previous day and on the night of June 7 as well. Imran was suffering from body aches as he was forced to sleep on a small bunk in a warm, mosquito-infested cell, the family member told CNM. The cell has a fan but the electricity is periodically cut off, the family member claimed. Minivan News is awaiting a response from the home ministry. Two criminal court judges who sentenced ex-president Mohamed Nasheed to 13 years in jail in a widely criticised trial have been appointed to the High Court today. 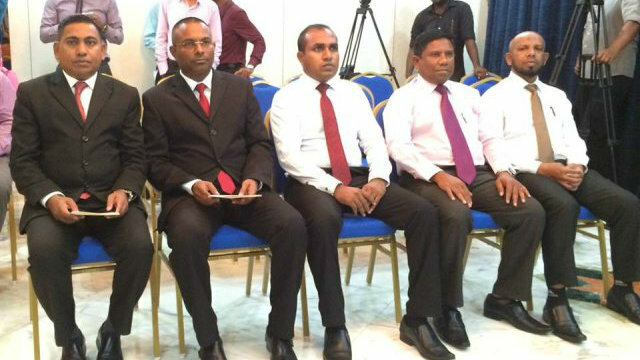 Judges Abdulla Didi and Sujau Usman took the oath of office at a surprise ceremony at the Supreme Court this morning. Two seats on the nine-member bench have been vacant since the high court’s chief judge was demoted to the juvenile court in August, and another judge retired in February this year. The appointment of new judges was stalled when the high court in October last year said the evaluation criteria was flawed. But the Supreme Court on May 28 overturned the ruling, paving the way for Didi and Usman’s appointment. The third judge in Nasheed’s terrorism trial was Judge Abdul Bari Yoosuf. He was awarded a discounted flat in a newly built luxury apartment complex in Malé. The former chief judge Ahmed Shareef was suspended in 2013, shortly after the high court suspended court proceedings against Nasheed on charges of arbitrarily detaining a judge during his tenure. The high court was reviewing the composition of the bench overseeing the trial. The Prosecutor General’s Office in February withdrew the lesser charges of arbitrary detention and filed new terrorism charges against Nasheed at the criminal court. The high court, in an October 2014 ruling, ruled that the criteria on evaluating a candidate’s educational qualification and experience was flawed and ordered the Judicial Services Commission to amend the criteria. The 100-point mark sheet awarded 35 points for education, 30 points for experience, 10 points for ethical conduct and 25 points for an interview. All candidates were to be put to a secret vote in the order of the candidates who received the highest points. 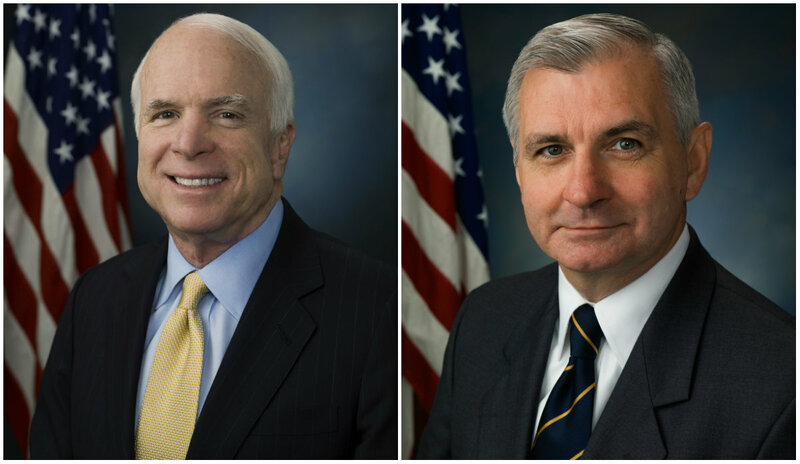 The first candidates who received a majority in the vote would be appointed. In evaluating the educational qualifications, a candidate with a degree in Islamic Shariah or a degree in common law would receive 20 points. But a candidate with a combined degree in Islamic Shariah and common law would receive 25 points. Candidates with a masters or a doctoral degree would receive an additional five points each. The criteria appeared to grade candidates on the title of their degrees, the high court said. For example, an individual who had a degree in common law may have done the same number of modules on Islamic Shariah as a candidate who had a combined degree in Islamic Shariah and common law. The high court noted an individual who had done a degree in common law or Islamic Shariah, and held a masters, would receive 25 points, the same as an individual who had just done a degree in Islamic Shariah and common law. The evaluation criteria for qualification awarded 30 points for ten years of experience as a judge, meaning it did not differentiate between candidates who had served as a judge for ten years or 20 years. The appellate court said judges must be awarded points proportionate to the number of years they had served as judges. The high court also ruled that the JSC cannot hold a secret vote to select candidates arguing the procedure was not transparent. 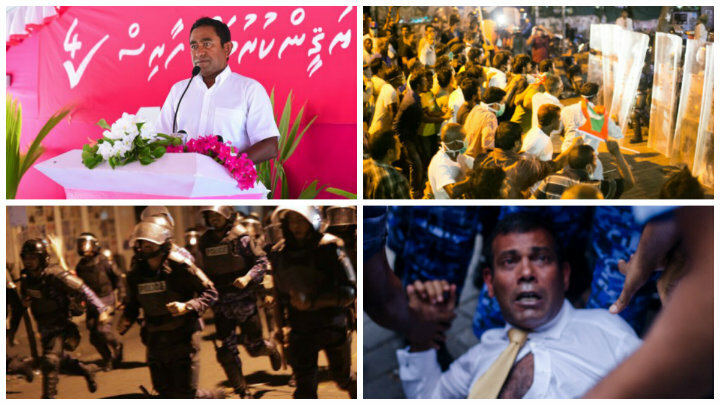 Foreign governments and international bodies have expressed concern over Nasheed’s 19-day trial, noting he was not given adequate time to prepare defense, barred from calling defense witnesses, and at times, denied legal representation. The three judges who oversaw Nasheed’s trial also sentenced ex-defence minister Mohamed Nazim to 11 years in jail in a weapons smuggling charge. The retired colonel said the weapons were planted at his home by rogue police officers on the orders of Tourism Minister Ahmed Adeeb. Adeeb has denied the allegations. Despite growing calls for Nasheed and Nazim’s release, President Abdulla Yameen said he has no constitutional authority to release the pair. 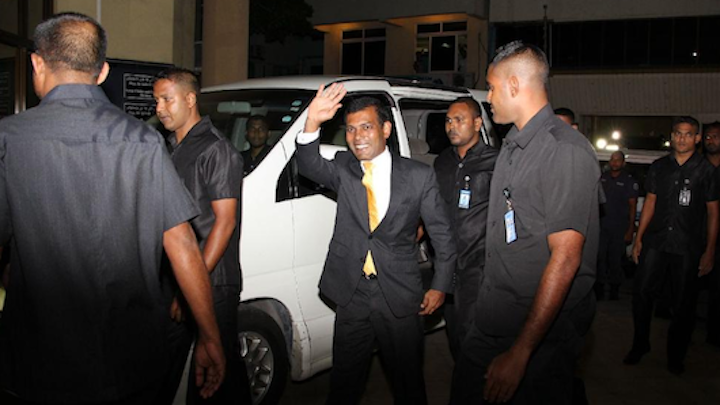 Nazim’s appeal at the high court is scheduled to begin on June 21. 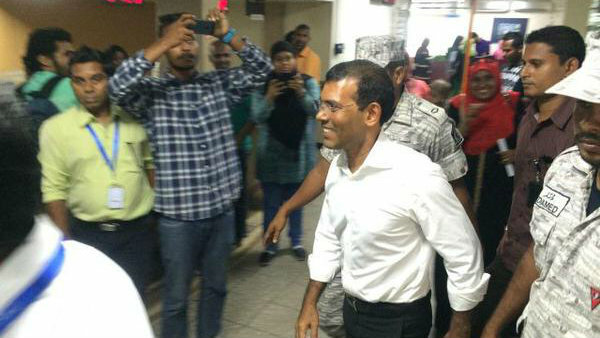 Nasheed was unable to file an appeal after the criminal court delayed releasing required case documents within the shortened ten-day appeal period. 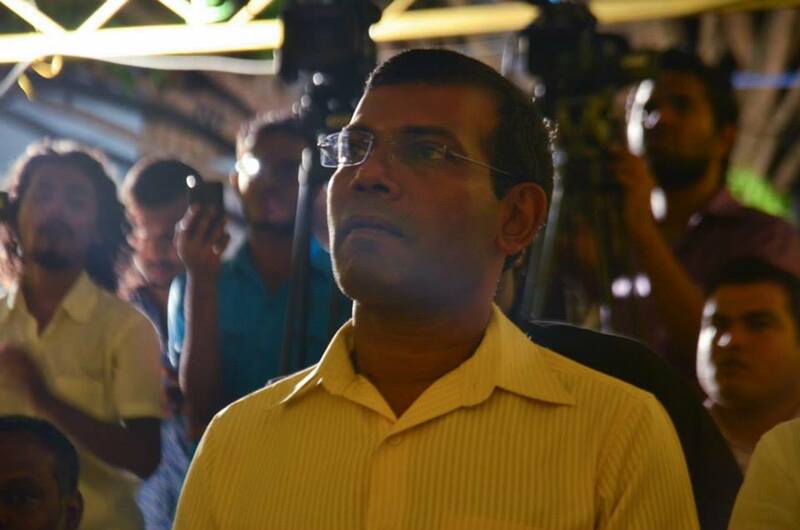 The government insists Nasheed can still file an appeal, but his lawyers say the law is silent on late appeals. They argue that the Supreme Court in January has removed the high court’s discretionary powers to accept late appeals in the ruling that had shortened the 90-day appeal period to ten days.